Many of us are experiencing a common problem that bothering us is loose neck skin. Loose skin makes you look aging too soon, it appears too bold that you really get embarrassed in front of people. There may be different reasons for loose skin. So, today we came up with 10 ways to get rid of the loose neck skin. Here are some tips to tighten your neck skin. Facial exercises are very effective; it is good to perform facial exercises. Not only for the people who have loose neck skin, but it also helped people to look young. After a regular exercise of a week or so you get to notice the change in your skin. It helps to relax the lower facial tissues and muscles. These exercises do not leave any marks of wrinkles or sagging. Two to five minutes of facial exercise regularly gives you a young look and glow to your skin. Banana is one of the effective masks that work for many problems. It is full of fresh anti-oxidants and lutein that make cells active. To make the banana mask here are the steps, apply this pack every day for best results. · Take a ripe banana and mash it very well without any lumps. · Then add curd and lemon juice and mix it well. · Add some drops of milk and glycerine to it. · Then finally add some baby oil and make it a good fine paste. · Apply this mixture to the neck and leave it for an hour. · Finally dab some water and massage with hands and the then rinse with water. Weight management prevents all problems. When a person gains weight the skin begins to stretch, and then with losing weight, the stretched skin remains as loose skin. So take certain steps to avoid weight gain so that your skin remains normal and healthy. Always try to maintain a healthy body and healthy skin. · Grate cucumber and take it into a bowl. · Then add cream, almond oil, and curd to it. · Make a fine paste by mixing well. · Apply to your neck and then allow it to dry for about 45 min. · Use rose water and cotton to clean it, and then apply moisturizer. · Repeat this process every day for best results. This magic 3 ingredient pack has 3 effective contents they are, olive oil, vitamin E capsules, and Vaseline. Olive oil helps to prevent premature signs of aging. A Vitamin E capsule is best known for its anti-oxidant property that helps from maintaining healthy skin. The third ingredient Vaseline provides deep moisturizing that helps to heel dry skin and keeps them hydrated. To prepare this mask the following steps are given below. · Take 10ml of olive oil and 3 vitamin E capsules and 3g of Vaseline. · Mix all the ingredients and heat it using double boiler i.e, keep a pot filled with water on the stove and when the water is about to boil place the bowl with the mixture. · Mix well until they combine well. · Then apply it to your neck every night and massage from bottom to the upside for 2 min then sleep with it. No need to clean it even moisturizes your skin. · Take 3 tablespoons of plain yogurt to add in 2 tablespoons of wheat germ. · Mix them well and then take another bowl and add half teaspoon yeast and add 1 teaspoon of water to it. · Let it sit for some time till the yeast activates then mix it well. · Then add it to the wheat and yogurt mixture and combine. · Apply that mixture to your neck area in the bottom to the upward direction, then leave it for an hour. · Then rinse it with some warm water and apply olive oil to your neck and massage it. · For best results, apply it 2 to 3 times a week. The unbalanced diet can be a reason for the loose neck skin. A lot of intake of junk food makes you fat and the skin starts to stretches in order to avoid this, take a balanced diet plan. Take fresh fruits and green leafy vegetables and boiled veggies in place of junk food. This is a slow process but at last, it leaves your skin, body and also hair healthy. Almond oil is rich in vitamin E along with anti-aging properties. This repairs premature aging and offers elasticity to sagging neck cells and improve skin’s firmness. By massaging almond oil around the neck area it also helps in increasing blood circulation. Regular application of almond oil makes your skin tighter than before. Make sure you massage well for at least 2 to 5 minutes in the bottom to upward direction all around the neck. Take 1 tablespoon of lemon juice and add 1teaspoon of castor oil in a glass bowl. Then add 2 tablespoons of petroleum jelly to it. Pour some water in a pot and bring it to boil then place the glass bowl in it, till it dissolves. Then allow it to cool and apply it to your neck and leave it no need to wash it off. Use it as a cream for neck skin; you will notice a change after doing it repeatedly. Hydrated skin is generally more plump and firm and less likely to sag or wrinkle. Consuming enough liquids every day can help you tighten your neck skin. Water is the best choice for your skin to stay hydrated, not only water you can also take juices diluted with water. Usually, women should take nine cups a day and men should take thirteen cups of water a day to keep your skin and body healthy. 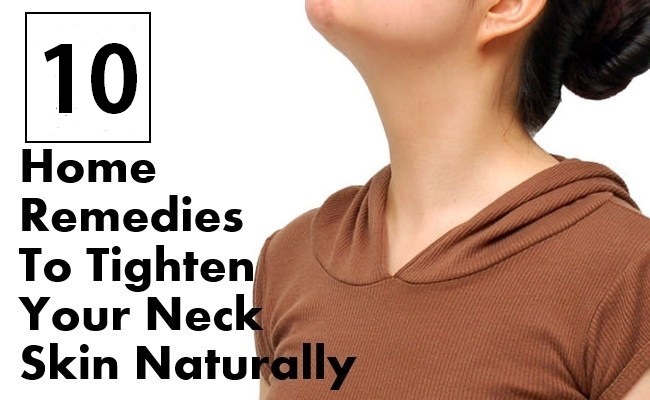 Here are the 10 natural ways to tighten your neck skin. Hope this list of natural ways to tighten your skin helps you to get healthy and glory wrinkle less skin. Stay tuned for more updates and do comment and share with your friends too.